Russian and South Ossetian authorities are denying any involvement in an alleged shooting incident near the President of Georgia's motorcade. Both Russia’s Foreign and Defence Ministries called the suggestion 'a provocation'. After celebrating the fifth anniversary of Georgia's Rose Revolution, the country's president Mikhail Saakashvili took his guest and long-time ally, Polish president Lech Kaczynski, on a tour near the war-ravaged region of South Ossetia. Shortly afterwards, the Georgian leadership says its convoy was ‘fired upon’ by Russian soldiers. The Polish president claims he didn't see anything because it was dark but believes he did hear something. After his return to Warsaw, President Kaczynski said that nobody but him should be blamed for the incident, because it was he who asked to change the route of the convoy. It was originally planned that he would only visit Tbilisi, but the Polish leader decided that he should also inspect the refugee camp near the South Ossetian border. “The risk was necessary. These are the obligations of the President of Poland. Everything that happened in Georgia happened under my agreement. I was not afraid,” he said. However, another Polish official, who witnessed the incident, Prime Minister Mikhail Kaminski, saw something a bit different from Kaczynski. “When we reached the Russian patrol, we heard gunshots from their side. There were at least three series of carbine shots, but the President stayed calm,” Mikhail Kaminski said. “I can’t say for sure whether they shooting into the air or aiming at us, but it’s obvious that they came from the Russian side,” he added. Meanwhile, a Polish Foreign Ministry officially announced it does not possess any information that would confirm that Russian soldiers were shooting in immediate proximity to the Georgian president’s motorcade. South Ossetian authorities say the presidential cars tried to cross the border with the republic, but insist that no shots were fired. Russia's Foreign Minister Sergey Lavrov called the incident another Georgian provocation aimed at undermining security in the region. “The Georgian authorities organise it all themselves and then blame Ossetians and Russians. No shooting was carried out from our positions or the South Ossetian side. This is not the first time the Georgians have done this. The same happened in August when Saakashvili hid from an alleged Russian bomb,” Lavrov said. That refers to an incident in the town of Gori back in August, when the Georgian president took cover after he thought Russian jets were approaching. 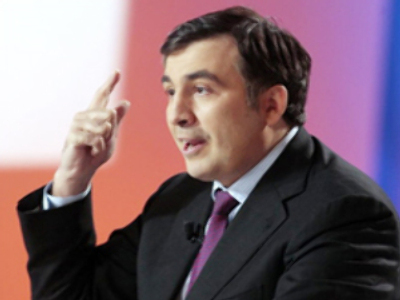 Saakashvili was speaking to reporters next to his vehicle when one of his security personnel raised the alarm. Saakashvili was torn away by bodyguards and pushed to the ground. They piled extra flak jackets on top of him. Fearing an air raid other people fled, looking skyward and screaming. However, no jets were seen or heard. Nevertheless, the Georgian media presented it to the world as a Russian attack.